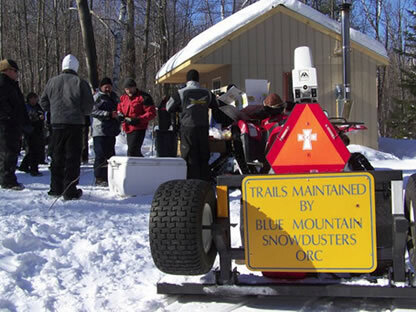 Blue Mountain Snowdusters, O.R.C, Inc.
Sled dogs in Grantham? Yes! Working with North Country Mushers and the Town of Grantham, we held a very successful Blue Mountain Sled Dog Race on February 18. There were 2 mushers who raced 34 miles and 8 mushers who raced 19 miles. The start was located at the Grantham Recreational fields and traveled throughout the BMSD trail system. We had 4 to 5 inches of fresh snow the morning of the race and the weather was perfect for spectators. We had viewing at the end of Walker Rd as well! The local Girls Scouts counted over 100 people—thanks to all who came out to enjoy this great event! Thank you to our local sponsors (Farmers Table Cafe, Ruger, Sugar River Animal Hospital, Sugar River Bank, Daisy Hill Farm, King Blossom Orchard, and Dunkin Donuts of Grantham) who supported the event. Also, thanks to BMSD club members who worked hard to prep the trails beforehand and post signage, and also manned the course during the event to help guide the mushers and report split times. Special thanks to our own BMSD musher, Elizabeth Strobridge, who conceived and worked tirelessly to make this unique event possible for all to enjoy. On another note, we also sincerely thank our retiring Trail Administrator, Bob Moulton, for his decades of dedicated service to our club. Bob has lent a helping hand in practically all aspects of the club, including trail work, grooming, equipment maintenance, administration, and fund raising. He and his wife Joanne also organized and ran the annual BMSD golf tournament for many years. Enjoy your retirement Bob! It was another unpredictable riding season this year, but we all managed to get in some great rides when conditions allowed. Thanks again to our landowners, groomers, club members, and all who ride our trails responsibly. Check our website for the time and location of our upcoming Annual Meeting. Also monitor our Facebook page for notices of offseason trail maintenance projects. See you on the trails next season! Next post: 2018 BMSD Golf Tournament!